Needles and Hooks and Books, Oh My! : Stash Bashing Thursday! I'm joining up with Tricia @ Crunchy Catholic Momma for the stash bash with an official post! "I've never met a crafter without a stash of some kind. This year my goal is to use up all the craft supplies I have spent money on that are taking up mental and physical space in my life. Join me here every Thursday for a Stash Bash." 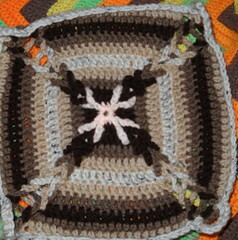 I've been doing some crazy stash bashing this week, again with 12" afghan squares. I made my 4th (or 5th, not really sure) Drop in the Bucket square just because I love it so much, and the possibilities of color combinations is immense. This one I did with sky blue, purple, and a marled yarn. I love it! I'm hoping that once I sew everything together, it'll straighten out. 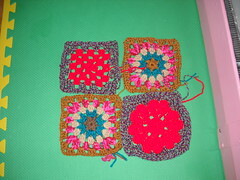 I also did a set of 6" blocks, using the Grandala pattern and the BAMCAL's Feb 6" Love & Honor-- the fourth square is a simple granny square, as I didnt like the Love & Honor square so much. These are only a few of the squares I've been hooking as part of my stash bashing. 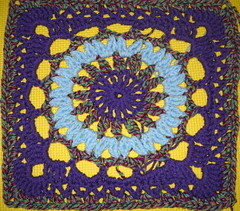 I've also decided to do 40 days of squares for Lent, and donate the resulting afghan(s) to a local charity (TBD). 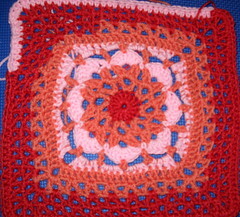 Besides the squares pictured here, I've hooked another Versailles square, a design that I have blogged about before. The March squares for the BAMCAL have been posted, so I'm sure you'll see those in future stash bashes. What a great idea for a stash bashing/Lent project. I am sure it will be greatly appreciated! It takes a lot of patience to do granny squares (at least to me) This is a wonderful project for lent : ) Can't wait to see your progress! Mmmm, motifs. I adore "Beyond the Square," sometimes I just...make motifs from it, just to see how they work up, and then frog them if I don't have a use for them. All the squares you've made here are just divine, lovely colours and stitching! FO Friday: Slippers, Hats and Flowers! WIP Wednesday: Knit and Crochet. Work-In-Progress Wednesday: Step One Done!